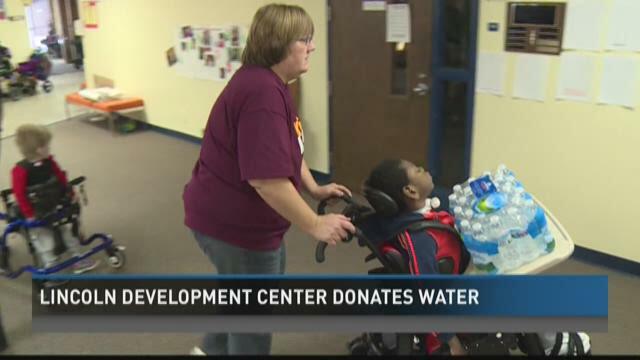 GRAND RAPIDS, Mich. (WZZM) -- At the Lincoln Development Center, students who need the most help are the ones now trying to help by donating drinking water to Flint. The Lincoln Development Center works with about 100 students from across the area who have multiple development challenges. Liesha Crawford is the teacher that spearheaded the donation effort. "We are collecting water," Crawford said. "We are calling it kids to kids water for Flint when we found out how bad the situation was over (there)." Using a cart, she guides Max a student to the donation table with a case of water. She uses the water as a teachable moment. The students count the number of cases. "We work on giving as a part of our program, which is reaching out giving out to the community by helping others," Crawford said. One of the school's staff members is a pastor at a local Flint church. "I got talking to him last week and asked what can our students do to help and he just said 'one word, 'water,'" Crawford said. Ansel Robinson works with students by day, but on the weekend drives to Flint to his congregation. "The feeling is one of despair, disenfranchisement, and one of fear and anger," he said. Robinson believes in the power of prayer, and says the water will have a positive impact: "The water from Lincoln Development Center is going to make big difference in the lives not just my congregation, but the Flint community.